Male/Female; Minimum of 2 years experience as Quality Technician; Major on mechanical related, can understand mechanical drawing well; Good in measurement equipment such as projector, calipers, etc. ; Can independently handle quality issue, troubleshooting, improvement plan set up and follow up; Fluent communication skill in English; Can understand ISO9001 quality management system. Male/Female; Minimum of 2 years experience as Quality Engineer; Preferably a holder of a bachelor’s/college degree relevant to or major on mechanical related, can understand mechanical drawing; Good in measurement equipment such as projector, calipers, etc. ; Can independently handle quality issue, troubleshooting, improvement plan set up and follow up, quality criteria set up; Can lead the cross function team for quality improvement project; Good quality report summary skill and clear mindset for quality management; Fluent communication skill in English; Can understand ISO9001 quality management system; Understand Lean production concept. Male / Female; 25 – 35 years old; Graduate of any 4 year Computer related course; Equipped with technical and troubleshooting skills; Preferably with project management background; With excellent interpersonal skills; Customer Service oriented; With at least 2 years experience in related field; Knows how to drive. Male; 19 – 26 years old; Preferably College level; Excellent communication skills. Male, not more than 30 years old; At least 5’6” in height; With pleasing personality; Candidate must possess at least Vocational Diploma/Short course in any field; Physically fit; Willing to undergo training and render overtime; Knows how to drive and with driver’s license; Excellent communication skills both oral and written; With good moral character; Can handle work pressures; Willing to work on Holidays, Sundays, extended hours; With good physical attribute, industrious, trustworthy and keen to details; Can relate effectively with different kind of people; Have a clean and neat appearance ( no body piercing of visible tattoos on forearms or legs). Male and female, not more than 35 years old; Must possess at least a vocational diploma/ short-course certificate; With at least 6 mos. of solid experience as a Room Attendant in a service or hotel industry; Has the highest standard of cleanliness; Must be good in oral & written communications; With good physical attribute, neat and clean, industrious, trustworthy and keen to details; With no visible tattoos on forearms/legs, and body piercings; Can effectively relate with different kinds of people; Able to work under pressure and with less supervision; Willing to work on weekends & holidays, and on extended hours. Candidate must possess at least a Bachelor’s/College Degree, Human Resources Management, Psychology or equivalent; At least one(1) year work experience in the related field is required for this position; Good Communication skills to deal with people internal to the company; Can work with minimum supervision; Computer literate. 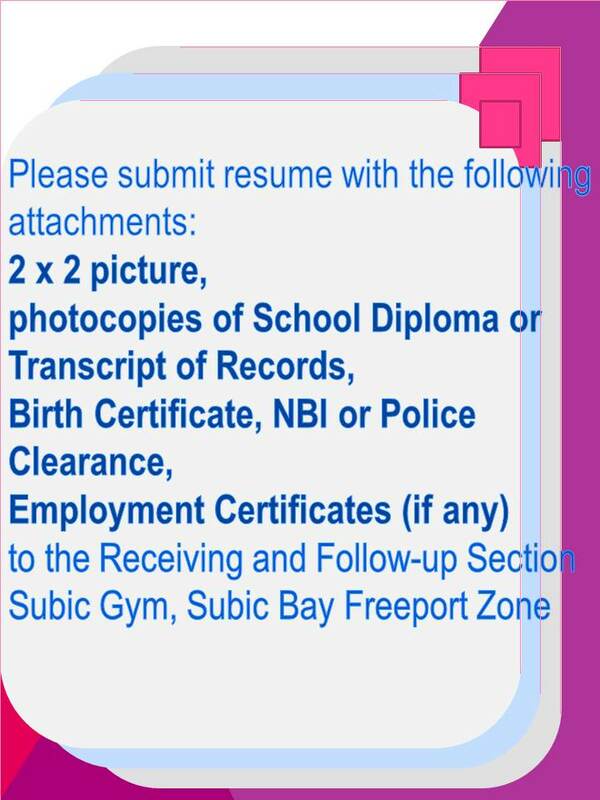 Candidate must be 18 to 26 years old; Must be friendly, courteous, cheerful and a team player; Has active listening and effective communication skills, both in Filipino and English; Must be willing to learn; Able to withstand work pressures; Must be physically and mentally fit; Willing to work on extended hours. Candidate must be 18 to 26 years old; With vocational diploma or short-course certificate in Bartending is an advantage; Must be friendly, courteous, cheerful and willing to learn; Has active listening and effective communication skills, both in Filipino and English; Able to withstand work pressures; Must be physically and mentally fit; Willing to work on extended hours. Candidate must be at least college level; Must be 18 to 26 years old; Can lift heavy objects; Must be willing to learn; Can withstand work pressures; Must be physically and mentally fit; Willing to work on extended hours. Candidate must be at least college level; Must be 18 to 26 years old; Can lift heavy objects; Must be willing to learn; Able to withstand work pressures; Must be physically and mentally fit; Willing to work on extended hours. Candidate must be 18 to 26 years old; Knows how to handle work tools; Must be willing to learn; Able to withstand work pressures; Must be physically and mentally fit; Willing to work on extended hours. Engineering graduate, preferably Chemical / Petroleum / Mechanical / Industrial Engineering. Male, 28 - 45 years old; With 5 years relevant work experience; At least high school graduate. 24 – 40 years old; Graduate of Vocational course on Automotive Electronics; With 3 – 5 years work experience in the related field; Good eyesight and normal color vision. At least High school level; With painting skills. Female; 26 years old and above; BS Accountancy graduate; At least 2 – 3 years experience; Extensive knowledge in accounting works ( Payroll, Bank Recon, Costing, Bookkeeping and other Mandatories); Excellent in oral and written communication skills; Able to work under pressure with minimum supervision.